Vlad Taltos is an assassin in the city of Adrilankha. He is a human in a land ruled by Dragaerans who have lives spanning thousands (upon thousands) of years. Vlad is a skilled assassin who has succeeded by virtue of skill, hard work, and with the good fortune of having some powerful friends. Besides being an assassin, Vlad also operates as mid-level mob boss in Adrilankha. 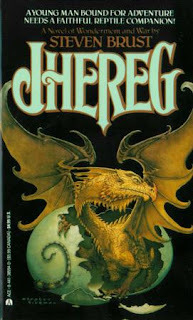 The primary storyline of Jhereg regards Vlad’s acceptance of a contract to kill a Dragaeran named Mellar, a member of the ruling Council of the Jhereg crime organization of which Vlad is ultimately a member. Mellar managed to steal the entire treasury of the Council and disappear. Vlad’s contract is not simply to kill Mellar, but to do so in a expeditious manner. Too many delays and word will get out that the Council can be hit, and that word may be enough to bring down the whole organization. The rest of the novel works like many an urban secondary world detective novel, only here the successful conclusion of the case will result in the death of the target, rather than the resolution of a mystery. Of course, Jhereg predates Glen Cook’s Garrett PI novels by half a decade, not to mention later works from Alex Bledsoe. I mention Cook and Bledsoe because they are very much in the vein of Jhereg and they are the easiest comparisons to what sort of novel Jhereg is. With that said, Steven Brust did it first and he is very much his own man here. Jhereg was my first real experience reading the fiction of Steven Brust (his Firefly fanfic novel nothwithstanding). I had seen the man twice at the Fourth Street Fantasy convention and was impressed by Brust in person, and plenty of people there spoke highly of his fiction, but somehow over the last two years I still delayed reading Jhereg. It’s one of those novels you put off reading for no good reason and then realize when you’re done that you were a damn fool for waiting because it’s really that good. Jhereg really is that good. The novel opens slowly, with a bit of history of the character, and Brust takes his time setting up the central conflict. The initial impression is that Brust is clever with dialogue, but the reader will expect to be merely satisfied by the end of the novel. But here’s the trick Steven Brust pulls off. The longer you stay with Jhereg the better it gets. The world becomes deeper and richer, the characters more compelling. Vlad Taltos becomes an old friend who you don’t mess with. Brust lures the reader in chapter after chapter. Before you know it, you’re hooked and you don’t want to put Jhereg down for fear you might miss what’s in the next chapter, and the next. There is really no better way to be introduced to Steven Brust. This is the first of twelve novels featuring Vlad Taltos and if Jhereg is any indication (it should be), once you read one, you’ll want to read the rest. If you haven’t read Brust before, you should. Fans of Glen Cook and Alex Blesdoe owe it to themselves to find the early Vlad Taltos novels and give them a shot (the first three are also collected in the omnibus edition The Book Jhereg). Brust has been on my radar for a while, but this gives me impetus to acquire that first Taltos collection. I've of course seen the books in stores since they were new, and it is worth mentioning that they are not doorstopper volumes, but instead tend to be in the 300 pages per volume length. Thanks for this suggestion!